The new Peugeot 208 range already features a wide choice of efficient petrol and diesel engines, but now the lowest CO2 version arrives on UK shores, with emissions as low as just 79g/km – making it the best-performing non-hybrid on the market. The larger 308 model has hatchback versions from 82g/km and the 308 SW estate – the biggest-in-class - from just 85g/km. The revised engine line-up means all versions of the Peugeot 208 meet stringent Euro 6 emissions standards, made possible with sophisticated BlueHDi technology ensuring every diesel version of the new 208 is below 95g/km of CO2 (benefiting from £0 VED and £0 Road Tax). There are two 79g/km models in Active and Allure trim levels, in both 3 and 5 doors, powered by the 1.6-litre BlueHDi 75hp with Stop & Start (S&S) technology. These 79g/km models are capable of achieving 94.2mpg (Combined Drive Cycle), can reach 106mph and are priced from £14,995 and £16,195. Other models utilising the same 1.6-litre BlueHDi engines are also available with three power level choices: in 75hp, 75hp S&S, 100hp and 120hp S&S. The 75hp, 75hp S&S and 100hp S&S are coupled with a five-speed manual gearbox. The 75hp and 100hp achieve 80.7mpg, while the 75hp S&S has economy of 94.2mpg – which is a record for the segment, and in the market. The 120hp S&S is mated to a six-speed manual gearbox and produces just 94g/km of CO2. Peugeot is rapidly reducing the CO2 emissions of all of its vehicles in a tangible way with the accelerated implementation of the 3-cylinder PureTech petrol and BlueHDi diesel engines, as well as the new 1.6-litre THP engines and EAT6 six-speed automatic transmission. Twenty Peugeot vehicles (five PureTech, three 1.6-litre THP and twelve BlueHDi) are class leading in their power class for CO2 emissions. These meet the demand by Peugeot for developing more environmentally friendly engines, in particular those that are cleaner and produce less CO2. Peugeot’s environmental performance helped the PSA Peugeot CITROËN Group maintain leadership in Europe in 2014 with average CO2 emissions of 110.3g/km, in a European market where the average is at 123.7g/km. 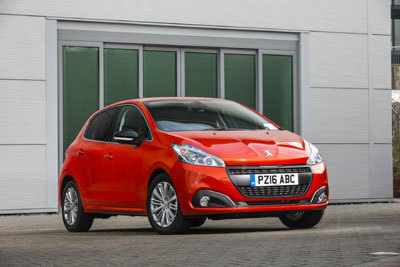 As an individual Brand the Peugeot product average is 109.5g/km. Combining SCR (Selective Catalytic Reduction) and an additive particle filter in a unique way, the BlueHDi technology demonstrates it is the most efficient and effective diesel emissions control system. Representing nearly 30% of all registrations, the B-segment is the second largest by volume in the European market. It accounts for two out of every three cars sold and Peugeot continues to be a dominant player in this sector with one million examples of the 208 produced.